AI has become a hot topic of discussion right now, with one side talking about its immense potential to revolutionize the world, while the other side led by the likes of Elon Musk keep warning about its destructive impact and an impending AI apocalypse. Leading professional services firm, PwC (PricewaterhouseCoopers) recently conducted a survey to assess the perception of AI among Indian firms, and found that 49% of the participants are willing to pay, or are already paying, for an AI-powered ‘smarter higher-touch customer service’. Titled ‘Artificial intelligence in India – hype or reality’, PwC’s survey sought to assess the perception of AI among Indian companies and evaluate the impact of AI when it comes to providing customer services. Out of the 49% participants who are inclined to pay extra to infuse some AI-smarts into the current customer service infrastructure, 26% expressed that they want a smarter AI-run customer service experience which can quickly resolve problems over text messages, and can also connect to a human personnel if the need arises. The rest 23% pointed that they can rely solely on an AI-powered customized customer service system which can solve queries over text messaging on its own, without any human assistance whatsoever. Another notable observation was that 24% of the participants agreed that they are occasionally unable to discern whether their last customer service interaction was with a chatbot or an AI, which gives us a clear idea about the advancements made in the field. 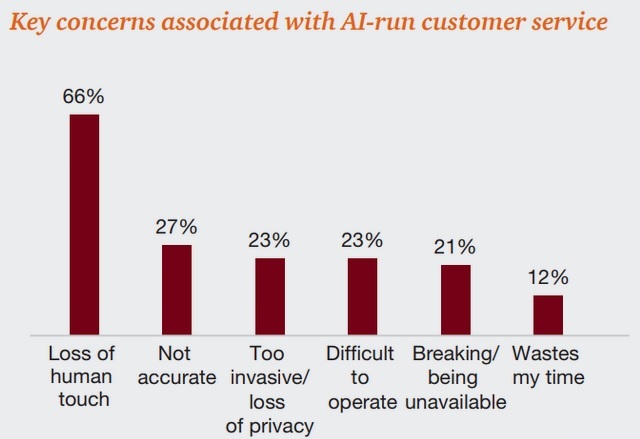 As for the concerns related to an AI-backed customer service, a hefty 66% of the participants expressed that the loss of a human touch is the biggest drawback, while 27% opined that it is not accurate. Inability to contextualize a situation, failure to understand customer-specific problems and ineptitude at picking up human cues were cited as the other general concerns associated with an AI-powered customer service system. As far as privacy goes, 23% of the participants expressed that such a service would be too invasive and that it would jeopardize their privacy.